Bank of America Merrill Lynch published an atlas called “Transforming World Atlas” recently. It has some interesting infographics and charts illustrating a lot of the demographic, cultural and economic changes that have changed globally. 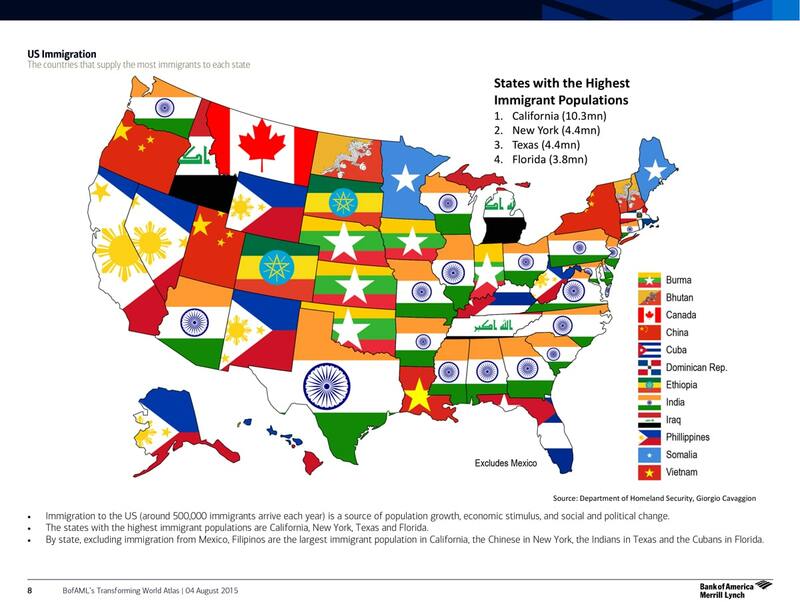 One interesting map we find illustrates which country, other than Mexico, supplies the most immigrants to each state. The map overlays the flag of each country over each state. The data was compiled from the Department of Homeland Security and shows some interesting information. Nationwide, the many of these immigrants are coming from Asian countries like China, India and the Philippines. The data reveals some interesting data, such as Somalis in Maine, Iraqis in Idaho, and Ethiopians in South Dakota.